Physician performing a physical exam on a newborn baby after a Caesarean section. Neonatology is a subspecialty of pediatrics that consists of the medical care of newborn infants, especially the ill or premature newborn infant. 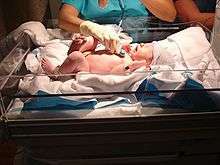 It is a hospital-based specialty, and is usually practiced in neonatal intensive care units (NICUs). The principal patients of neonatologists are newborn infants who are ill or requiring special medical care due to prematurity, low birth weight, intrauterine growth retardation, congenital malformations (birth defects), sepsis, pulmonary hypoplasia or birth asphyxias. While high infant mortality rates were recognized by the British medical community at least as early as the 1860s, modern neonatal intensive care is a relatively recent advance. In 1898 Dr. Joseph DeLee established the first premature infant incubator station in Chicago, Illinois. The first American textbook on prematurity was published in 1922. In 1952 Dr. Virginia Apgar described the Apgar score scoring system as a means of evaluating a newborn's condition. It was not until 1965 that the first American newborn intensive care unit (NICU) was opened in New Haven, Connecticut and in 1975 the American Board of Pediatrics established sub-board certification for neonatology. The 1950s brought a rapid escalation in neonatal services with the advent of mechanical ventilation of the newborn. This allowed for survival of smaller and smaller newborns. In the 1980s, the development of pulmonary surfactant replacement therapy further improved survival of extremely premature infants and decreased chronic lung disease, one of the complications of mechanical ventilation, among less severely premature infants. In 2006 newborns as small as 450 grams and as early as 22 weeks gestation have a chance of survival. In modern NICUs, infants weighing more than 1000 grams and born after 27 weeks gestation have an approximately 90% chance of survival and the majority have normal neurological development. In the United States, a neonatologist is a physician (MD or DO) practicing neonatology. To become a neonatologist, the physician initially receives training as a pediatrician, then completes an additional training called a fellowship (for 3 years in the US) in neonatology. In the United States of America most, but not all neonatologists, are board certified in the specialty of Pediatrics by the American Board of Pediatrics or the American Osteopathic Board of Pediatrics and in the sub-specialty of Neonatal-Perinatal Medicine also by the American Board of Pediatrics or American Osteopathic Board of Pediatrics. Most countries now run similar programs for post-graduate training in Neonatology, as a subspecialisation of pediatrics. In the United Kingdom, after graduation from medical school and completing the two-year foundation programme, a physician wishing to become a neonatologist would enroll in an eight-year paediatric specialty training programme. The last two to three years of this would be devoted to training in neonatology as a subspecialty. Neonatal Nurse Practitioners (NNPs) are advanced practice nurses that specialize in neonatal care. They are considered mid-level providers and often share the workload of NICU care with resident physicians. They are able to treat, plan, prescribe, diagnose and perform procedures within their scope of practice, defined by governing law and the hospital where they work. Neonatologists make on average $290,853. A 30 minutes old infant in Iran. The nurse is doing some care necessaries after birth. Rather than focusing on a particular organ system, neonatologists focus on the care of newborns who require Intensive Care Unit (ICU) hospitalization. They may also act as general pediatricians, providing well newborn evaluation and care in the hospital where they are based. Some neonatologists, particularly those in academic settings, may follow infants for months or even years after hospital discharge to better assess the long-term effects of health problems early in life. Some neonatologists perform clinical and basic science research to further our understanding of this special population of patients. Birth is one of the most common reasons for hospitalization. The average hospital costs from 2003-2011 for the maternal and neonatal surgical services were the lowest hospital costs in the U.S. In 2012, maternal or neonatal hospital stays constituted the largest proportion of hospitalizations among infants, adults aged 18–44, and those covered by Medicaid. Between 2000 and 2012, the number of neonatal stays (births) in the United States fluctuated around 4.0 million stays, reaching a high of 4.3 million in 2006. Maternal and Neonatal stays constituted 27 percent of hospital stays in the United States in 2012. However, the mean hospital costs remained the lowest of the three types of hospital stay (medical, surgical, or maternal and neonatal). The mean hospital cost for a maternal/neonatal stay was $4,300 in 2012 (as opposed to $8,500 for medical stays and $21,200 for surgical stays in 2012). ↑ Baines, M.A. (1862). "Excessive Infant-Mortality: How Can It Be Stayed?". Retrieved 2007-02-18. ↑ American Academy of Pediatrics (2001). "Committee Report: American Pediatrics: Milestones at the Millennium". Pediatrics. 107 (6): 1482–1491. doi:10.1542/peds.107.6.1482. PMID 11389283. ↑ Lemmons, J.A. ; et al. (2001). "Very Low Birth Weight Outcomes of the National Institute of Child Health and Human Development Neonatal Research Network, January 1995 Through December 1996". Pediatrics. 107 (1): 1–8. doi:10.1542/peds.107.1.e1. PMID 11134465. ↑ Weiss AJ; Barrett ML; Steiner CA (July 2014). "Trends and Projections in Inpatient Hospital Costs and Utilization, 2003-2013". HCUP Statistical Brief #175. Rockville, MD: Agency for Healthcare Research and Quality. ↑ Wiess, AJ & Elixhauser A (October 2014). "Overview of Hospital Utilization, 2012". HCUP Statistical Brief #180. Rockville, MD: Agency for Healthcare Research and Quality. ↑ Witt WP, Wiess AJ, Elixhauser A (December 2014). "Overview of Hospital Stays for Children in the United States, 2012". HCUP Statistical Brief #186. Rockville, MD: Agency for Healthcare Research and Quality. ↑ Moore B; Levit K & Elixhauser A (October 2014). "Costs for Hospital Stays in the United States, 2012". HCUP Statistical Brief #181. Rockville, MD: Agency for Healthcare Research and Quality.